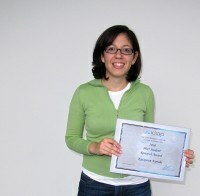 Idiap is proud to award the PhD student research prize 2010 to FARRAHI Katayoun. 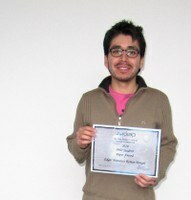 Idiap is proud to award the PhD paper prize 2010 to ROMAN RANGEL Edgar Francisco. Paper Title: "Analyzing Ancient Maya Glyph Collections with Contextual Shape Descriptors ". Authors: Edgar Roman-Rangel, Carlos Pallan, Jean-Marc Odobez, Daniel Gatica-Perez. International Journal of Computer Vision. October, 2010, pp. 1-17-17.